In 1994, a group of volunteers participated in helping after a devastating flood in southern China. Upon discovering the poor living conditions in the surrounding area, the volunteers established a school in Guangxi province in an effort to raise local standards of living. Over ten years spanning from 1994 to 2004, thanks to the generous support of individuals and organizations, our volunteers helped establish almost 400 schools in remote areas of Guangxi, Yunnan, Jiangxi, Shaanxi and Guizhou provinces. Starting from 1997, focus has been on Guizhou, China's poorest province, helping to establish schools and subsidizing financially struggling students. A study in 1996 found Guizhou to be especially stricken by poverty and few charities worked there. The educational programs in the mountainous areas were found to be outdated, children not attending school were many, and poverty was widespread. Our organization decided to concentrate our resources on improving the education for children in Guizhou. 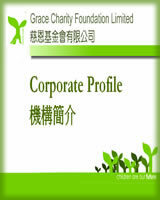 After years of hard work, we continued to request for other organizations in Hong Kong to work in Guizhou. A portion of the education facilities were improved and some students who could not originally attend school are now able to. However, the environment in Guizhou is difficult to live in and the education of the poorer regions are still backward. Through us and other cooperating charities, three hundred new facilities were built in Guizhou. Yet the number of facilities needed in the province are still many. Hence, our organization has decided to focus on Guizhou for the time being.